These patient drapes, which feature a self-adhesive U-shaped cut, are made in a variety of fabrics and dimensions in order to meet the different needs of the medical staff using them. Omnia patient drapes include 2-layers of non-woven fabric and Softesse®. Both are made of two layers making the surface 100% impermeable to fluids and micro-organisms. 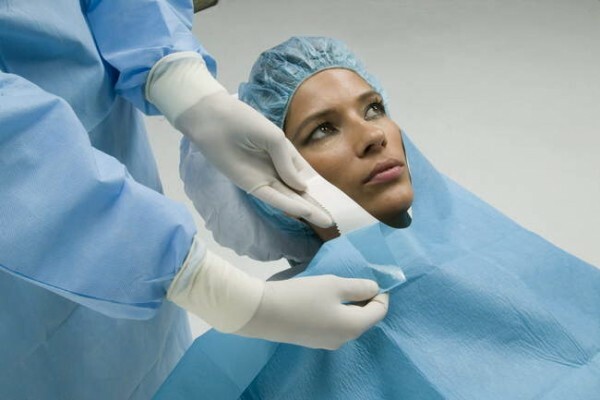 The special U-shaped cut on the short side of the drape allows easy positioning close to the lower lip or neck of the patient to create an effective sterile barrier. Both feature quick setup and easy draping to mitigate the risk of contamination and loss of time. The protective film on the self-adhesive strip is divided into pre-cut sections so you can customize your covering. The protective film is easy to remove.